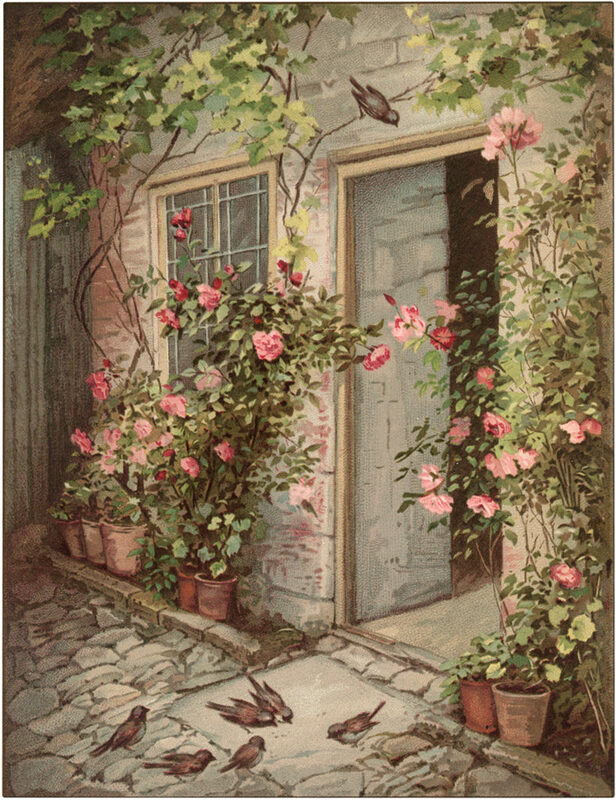 Today I’m sharing this Nostalgic Cottage with Climbing Pink Roses and Birds Image! This peaceful front door scene of a brick cottage with a stone walkway, is just lovely. Climbing pink roses, growing from terra cotta pots, surround the window and doorway. A group of tiny birds feast on seeds on the stoop as the mama bird watches from above. It is a beautiful print ready to frame or would nice to use in your Craft or Collage Projects! Lovely Vintage Countryside Stone Cottage Image! Charming Vintage Morning Glory Card Image! 16 Horse Clip Art Images! Will be framing both of these cottages, makes me think of books I just finished last week by Rosamunde Pilcher – Shell Seekers and Coming Home. Made a transfer of cottage with birds and roses to embroider particular features for a pillow cover. Can hardly wait to start it. Thank you so much for sharing these cottages, will hang them in our room. I love these images of cottages with the stonework, the ivy, the roses – fabulous! What a beautiful setting this makes for making greeting cards, decoupage, etc. I hope you find more like these – just breathtaking! Thanks so much Irene, have a great weekend! !